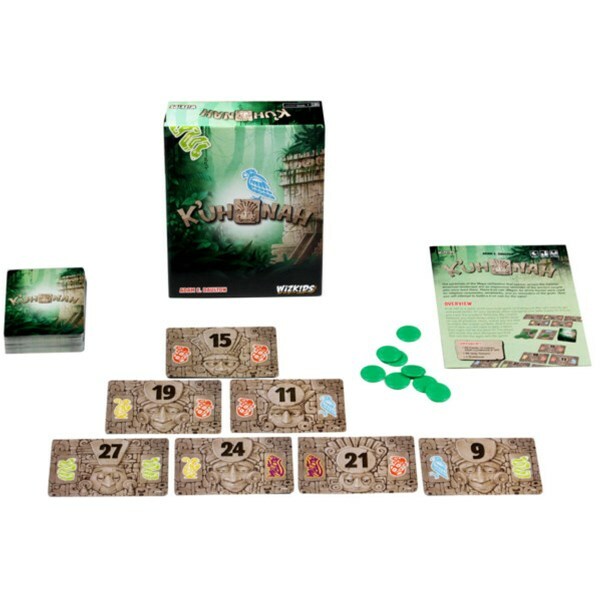 WizKids is pleased to announce that its new pyramid-building card game inspired by the ancient Mayan civilization, K’uh Nah, is now available in North American game stores! In this push-your-luck style game from designer Adam Daulton, players build Mayan pyramids, (known as k’uh nah or divine houses), seeking to honor the gods by building the largest and most spectacular k’uh nah. Players choose differently-numbered block cards with a variety of symbols on them from a communal Quarry in the center of the table. They must build their pyramid by playing the higher-numbered cards above the lower numbered ones, building out their base if they’re unable to do so. Players may also choose to match the symbols on the cards in order to place heavier blocks above lighter ones. If they do not want a card form the Quarry, they can place a jade token on a card. The game ends when no more cards can be added to the Quarry, and the player with the lowest score (determined by adding together the values of the non-supporting cards in their pyramid and subtracting what jade tokens they have left) wins. K’uh Nah is available now, so be sure to pick it up at your Friendly Local Game Store today!